The work perks that get noticed make you feel like a kid again: free snacks. Foosball tables. Video games. SpareFoot, an Austin, Texas self-storage marketplace, had all of that and more. But a recent amenity was something any parent could appreciate: a dining room table. With a nod to the old adage "families that eat together, stay together," startups like SpareFoot and other small companies are using the humble table to reconnect. They're also looking to boost productivity. Whether they are serving 25 people or 600, companies claim steep benefits such as enhanced trust and communication efficiencies that shared meals can bring. “In the world of a creative economy, work is better with trust. It’s better with social bonds," says Kevin Kuske, a workplace anthropologist and the general manager of Turnstone, a line of office furniture through Steelcase geared to smaller companies and entrepreneurs. "When you’re trying to build trust, creativity and relationships, you want to bring barriers down and get people to start acting more neutrally and food is just a way to do that." At Brooklyn’s Kitchensurfing, meals are often served family style. Sometimes they are prepared in advance by a chef as an audition for the online chef marketplace. Indeed, eating together is a powerful but untapped tool to encourage cooperation and collaboration, says Ben Waber, CEO of Boston’s Sociometric Solutions, a company that analyzes workplace communication patterns. A cohesive network of people can develop lingo and specialized shortcuts for communication, almost as if they have their own language, as they become more effective at speaking with each other. This easy conversation flow is essential to increasing trust and efficiency. With programmers, for instance, it can take 32 percent longer to complete code without proper communication, notes Waber. Those in large organizations deal with thousands of projects with subordinate tasks, but eventually non-critical needs can be forgotten or ignored altogether if teams don’t know who’s responsible for what or how to communicate with other staffers. “That’s where you start getting very large problems,” adds Waber. And while office-wide lunches might free up communications between isolated departments, there are ideal parameters to stick to. For ultimate lunch interaction, for instance, table size matters. Sociometric Solutions tracked workplace behaviors with sensors built into office IDs at an online travel company. It had both cafe tables that seated four and longer tables that seated 12. Staffers who sat at the larger table were 36 percent more likely to interact with each other later in the day. This group was also more engaged. When layoffs occurred at this company, those who’d sat at the larger tables were 30 percent more resistant. Staffers eat catered meals together each day at RocketFuel. 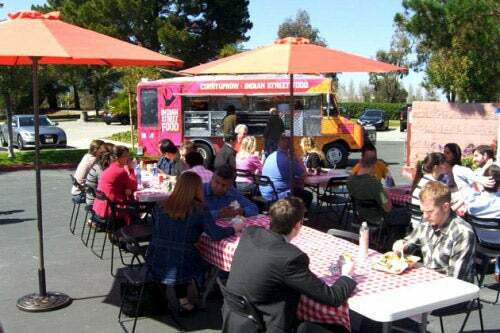 Once a month, lunch is provided by a range of popular Food Trucks. Shared meals are typically baked into a company’s food culture from its earliest days. As companies grow, those founders continue to use meals to bring larger staffs together and forge that communal feeling. Chris Muscarella, founder and chief executive of Kitchensurfing, a Brooklyn, N.Y.-based online chef marketplace, says that in its first year, the company has seen a 50 percent jump in young companies planning shared meals with employees, mostly on a weekly or bi-weekly basis. In startups, he adds, it's become more and more common to see communal meals at least once a week. For its part, Kitchensurfing was drawn to its current Brooklyn brownstone location for its communal meeting areas, available on nearly every floor of the house. It’s not uncommon for staffers to grab a beer for a quick drink on the sundeck or cook breakfast for members of the 25-person team in the townhouse’s full kitchen. While chefs do serve the staff as they audition for the service, staffers organically gather for lunch together whether food is formally being served or not. HowAboutWe, a digital network to help couples find and stay in love, recently expanded to 91 people. The staff that used to work in a single office is now separated into several different offices on the same floor of their Brooklyn headquarters. Lunch is a key time for this newly separated team to come together. The move was so new, at a recent lunch, new high-top lunch tables were still in their boxes. But staffers used to sitting with each other didn’t run to their desks. They grabbed spots on nearby couches or simply sat in a circle on the tile. 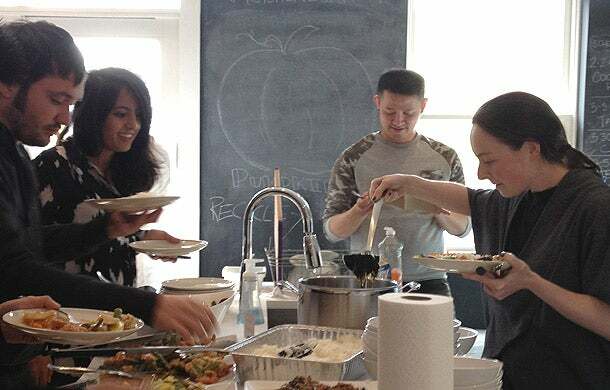 Brian Schechter, HowAboutWe's co-founder, says weekly meals help staffers feel connected not just to each other but to how they contribute to the company’s mission, especially as it grows. "The difference between someone who understands what they are working toward and someone who doesn’t is really dramatic." He adds, "Without the food and without the social lubrication that it creates, the experience of 'I don’t know what’s going on' would really amplify." Meal planning for any family can be complicated, and planning for a current staff of 600 isn’t any easier. Kiwoba Allaire, the events and community outreach lead at California-based advertising technology company Rocket Fuel created the food program that arranges for daily catering as well as a monthly Food Truck Friday. During meals, staffers eat at long foldable tables. She’s in constant communication with staffers about dietary restrictions and allergies, and these conversations start on each staffer’s new hire tour. Allaire makes sure that all dietary restrictions and preferences are accommodated, and those who don’t eat soy, meat, nuts or gluten have options. On top of these restrictions, Allaire makes meals nitrate free and lactic-acid free when she can, to keep options as healthy as possible. “I’m like the mom. I want to make sure everyone eats the healthiest. I treat everyone like my kids,” says Allaire.